Without thinking about it, we use our shoulders to accomplish many day to day tasks and we know immediately when something is not working correctly. Day to day use and wear and tear of the shoulder can cause pain and tenderness. A common shoulder injury, called subacromial impingement syndrome, can cause severe pain if not treated. The shoulder is a ball and socket joint which, if functioning properly, moves freely in many directions. The AC joint, or acromioclavicular joint, where the clavicle (collar bone) and shoulder blade meet, is a common area for pain and lowered mobility due to injury or arthritis. 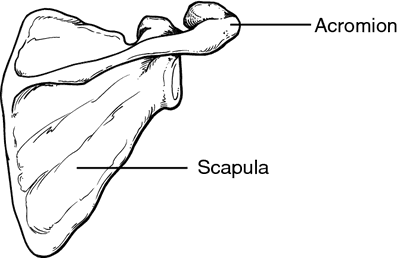 The acromion is the part of the shoulder blade that meets the clavicle, and between them is cartilage that allows the bones to move together. There are four muscles that raise and lower the arm which together are known as the rotator cuff. The rotator cuff lies under the AC joint, and in between the space is subacromial bursa, which is filled with fluid that lets the shoulder glide in the socket. When we raise our arm, the space between the rotator cuff and the acromion becomes narrow. 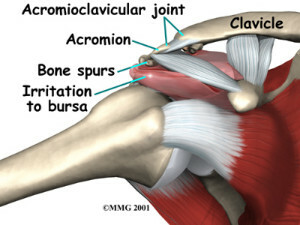 If the acromion rubs against the bursa and the tendons in between, it can cause pain and irritation, and loss of mobility. Sometimes and physiotherapy (PT) and injection of various medications can alleviate the symptoms of subacromial bursitis or rotator cuff tendinitis. However, at time it becomes necessary to utilize surgical methods to treat this problem. There are different surgeries used to correct the bursitis: open acromioplasty (OS) or arthroscopic acromioplasty (AS). Open acromioplasty is a procedure that involves a long open cut to the skin through the deltoid muscle to reach the inside of the shoulder. 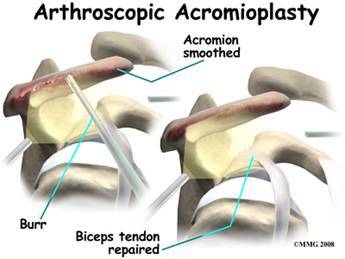 Damaged tissue is removed, part of the acromion is removed, and the shoulder is stitched back together. Arthroscopic acromioplasty is less invasive, uses smaller incisions, and a camera is inserted into the damaged area for assessment. Small tools are then used to correct the damage in the shoulder. Physiotherapy is the use of non-surgical techniques, such as analgesics and exercise to help heal the area. This has been effective in many patients with less severe damage to their shoulder. A study was done on 87 patients to compare the different types of treatment, both surgical, and non-surgical, to understand the best course of action for those with subacromial impingement. The patients were randomly put into groups based on their treatment and all had comparable demographics. Both the OS and the AS groups had improved at a greater level than the PT group. The OS group had more strength than prior to the surgery, and all groups improved with internal rotation. In general there was no significant differences in the 3 groups, although the patients who had the most invasive surgery, open acromioplasty, versus shoulder arthroscopy, had a greater improvement over time. These findings are interesting as most dedicated shoulder surgeons do not use open acromioplasty, as the arthroscopic approach uses a minimally invasive technique. Shoulder pain, tenderness, and swelling is frustrating and limits basic mobility. There have been great strides in sports medicine in the last decade. Contact our shoulder specialists and seek out the best orthopedists to treat your shoulder pain.